Google has offered €150m (£108m) in funding to help news publishers across Europe “develop more sustainable models for news”. The Digital News Initiative move comes weeks after the internet search engine company was accused of abusing its near monopoly position in Europe and threatened with a fine of up to €6.2bn by the European Union. According to analysis by the website Quartz, Google made revenue of €17bn in Europe in 2013 and paid €28m tax in Ireland. It is estimated to command more than 90 per cent of the search engine market across Europe. Google's international head of news partnerships Madhav Chinnappa told Press Gazette that the new scheme was unrelated to the competition inquiry the company is facing in Europe. He said: "It goes way back before that. It follows on from discussions we have been having since the end of last year with a group of publishers who we see as our critical friends. "This didn't happen in a week, this has been going on for some time. It's really about our place in the news ecosystem. We've always felt we were a positive part of that ecosystem and we want to make sure that continues." Google said in a statement: "The goal is to help support a sustainable news ecosystem and promote innovation in digital journalism through ongoing collaboration and dialogue between the tech and news sectors. The DNI will seek to extend its work to other European publishers and anyone involved in Europe’s digital news industry will be able to take part in any or all of its elements." Google president of strategic relationships in Europe Carlo D'Asaro Biondo said in a statement: "Through the Digital News Initiative, Google will work hand in hand with news publishers and journalism organisations to help develop more sustainable models for news. This is just the beginning, and we invite others to join us." "Google and news publishers will establish a ‘product working group’ to enable a close, ongoing dialogue exploring product developments to increase revenue, traffic and audience engagement. "The product working group will be a small body drawn from European publishers, large and small, representing the news industry’s priorities and acting as a conduit for dialogue focusing on ads, video, apps, data insights, paid-for journalism and Google News. "Google and the founding publisher partners have begun exploring a range of product ideas and expect further proposals as the DNI develops. "The intention is that this dialogue will lead to product developments which will benefit the news eco-system globally." 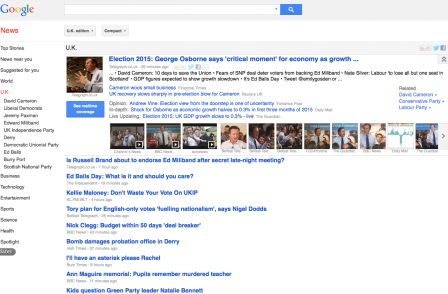 "Google will support and stimulate innovation in digital news journalism over three years. "Over this period, Google will make available €150m for projects which demonstrate new thinking in the practice of digital journalism. "Anyone working on innovation in online news will be eligible to apply, including established publishers, online-only players and technology startups in the news space. "The DNI will establish criteria and processes in discussion with an advisory group of publishers and organisations with expertise in journalism grant-making. "Applications will be assessed based on their level of innovation, viability and potential impact." enhanced online resources and tools for journalists." Google has also said it will fund research into the changing news landscape. According to the Internet Advertising Bureau, the UK online advertising market was worth £7.2bn last year – but only a tiny fraction of this total went to publishers. More than half (£3.8bn) was spent on search advertising, with the vast majority of that total going to Google. News Corp and Germany’s Axel Springer have both been outspoken critics of Google at a corporate level and are absent from the list of founding partners. The Guardian’s international director Tony Danker said in an article today: "As a founder partner, we recognise this initiative will be seen as a handout to some, but we sense there is something quite fundamental to play for. "Our challenge is that the economics do not yet stack up and no publisher has yet cracked a successful digital business model for original, quality and trusted journalism. "There are plenty of start-ups building mass audiences using algorithmic techniques with almost no new investment in content. Then there are those of us who believe there is still a need for significant and professional journalists and a need for robust and resilient journalism institutions with the resources it takes to challenge the most powerful in society: from large multinational corporations to governments and security establishments. "The question is: does Google believe this too? The reason why The Guardian and seven other European publishers have worked together to launch this initiative is a belief that it is in Google’s self-interest to do something critical: use its power to support a vibrant and sustainable ecosystem for news and journalism." Google was last month issued with a charge-sheet of alleged competition violations after a five-year investigation by the EU. It is alleged that its search engine has given unfair prominence to its own services. It could face a fine of up to 10 per cent of its global turnover, or more than €6bn. I am playing this free online Yahtzee game and share it with all my friends and ask them about this exciting board game. I found myself very happy to enjoy independently.